Here we go! 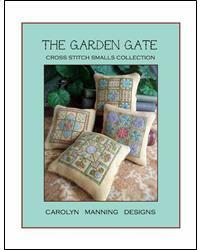 The Garden Gate Cross Stitch Smalls. The first in the new Cross Stitch Smalls Collection! Four little cross stitch smalls with floral motifs. Each stitches up at 57w x 57h. Six Sulky® cotton petite threads used throughout all four designs. All full stitches. Quick and fun. Perfect little projects!